Biotin contributes to normal energy-yielding metabolism. Biotin contributes to normal functioning of the nervous system. Biotin contributes to normal macronutrient metabolism. Biotin contributes to the maintenance of normal skin. Niacin contributes to normal energy-yielding metabolism. Niacin contributes to the maintenance of normal mucous membranes. Niacin contributes to the maintenance of normal skin. Pantothenic acid contributes to normal energy-yielding metabolism. Riboflavin contributes to normal energy-yielding metabolism. Riboflavin contributes to normal functioning of the nervous system. Riboflavin contributes to the maintenance of normal mucous membranes. Riboflavin contributes to the maintenance of normal red blood cells. Riboflavin contributes to the maintenance of normal skin. Riboflavin contributes to the maintenance of normal vision. Riboflavin contributes to the normal metabolism of iron. Riboflavin contributes to the reduction of tiredness and fatigue. Thiamine contributes to normal energy-yielding metabolism. Thiamine contributes to normal functioning of the nervous system. Thiamine contributes to normal psychological function. Biofood multivitamin for men with 25 nutrients and 17 organic herbs for energy, men's health issues, the immune system, digestion, metabolism and gastrointestinal issues (stomach). Nature doesn't make it any better than this! Multivitamins in nutrient concetrate. Forget other synthetic multivitamins, because the vitamins, minerals and trace elements contained in MultiVita-HIM&trade; come in a nutrient concentrate. The bioavailability of this product is similar to the vitamins you get from your natural diet. The logical response to the absorption problem was researched in order to develop essential nutrients that are "integrated in nutritional concentrates" in accordance with the idea of "vitamins in natural foodstuffs." The results can be seen in the excellent nutritional supplements by EnergyBalance. MultiVita-HIM™ is tailored to your body just like perfectly-balanced wholefoods that have been concentrated and pressed into a few tablets. MultiVita-HIM™ contains all the vitamins and minerals and the amounts match the nutrient content structure of grain, vegetables, legumes and fresh fruits (see table below). Because MultiVita-HIM™ is structured just like wholefood nutrients, it can be safely and effectively absorbed by your body. 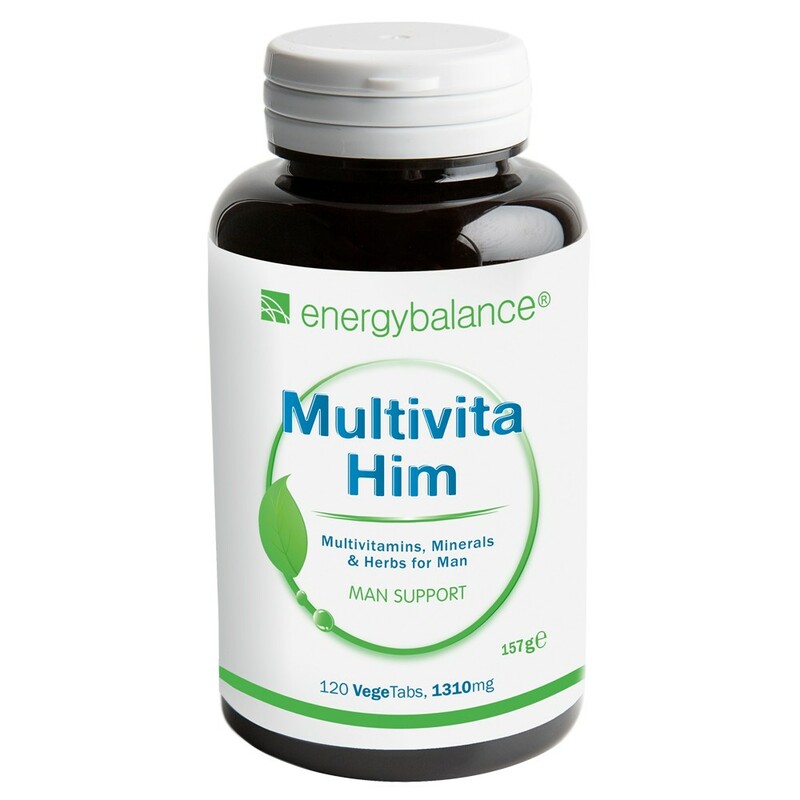 MultiVita-HIM™ is rich in vitamins, minerals and also contains 40% protein, 37% carbohydrate complex and bioflavonoid. Each of the vitamins and minerals in MultiVita-HIM™ is contained in a foodstuff concentrate consisting of proteins, carbohydrates, fats and bioflavonoids - and guarantees excellent absorption, retention and processing by your body. The product has been tested by independent scientists and leading universities in more than 60 scientific studies. We use a slow, involved process to press MultiVita-HIM™ into tablets This process guarantees that all of the substances we want in the tablets are included. That's why the body can more effectively absorb and use the MultiVita-HIM™ vitamins and minerals than it can isolated products.